What Does Code P2A00 Mean? OBD II fault code P2A00 is a generic code that is defined as “O2 [Oxygen sensor] Sensor Circuit Range/Performance Bank 1 Sensor 1”, and is set when the PCM (Powertrain Control Module) detects an abnormal, erratic, or implausible voltage in any circuit that is associated with the oxygen sensor that is labelled #1 on Bank 1 of V-type engines. 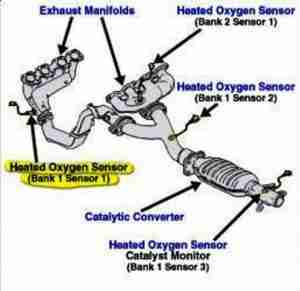 Note that Bank 1 refers to the bank of cylinders that contains cylinder #1, and that #1 refers to the oxygen sensor that is located upstream of the catalytic converter. The function of oxygen sensors, in the case, the upstream oxygen sensor is to monitor the concentration of oxygen in the exhaust stream, and to do this, the sensor is located in such a way that the exhaust stream passes over a sensing element. The sensor draws in ambient air through its wiring, and this air used as a reference point that is compared to the amount of oxygen in the exhaust stream. In terms of operating principles, an oxygen sensor’s sensing element has to be at a certain temperature to be effective and while on older sensors this heat was supplied by the exhaust gasses, newer, heated oxygen sensors are fitted with dedicated heating elements that are supplied with a current by the PCM. The practical advantages of this are that oxygen sensors reach their effective operating temperatures much faster, which greatly reduces harmful exhaust emissions. Assuming that an oxygen sensor and its associated circuits are fully functional, the concentration of oxygen in the exhaust stream causes a change in the electrical resistance of the sensing element. As a practical matter, the sensor is supplied with a 5-volt reference voltage by the PCM, and this voltage changes as a direct result of the concentration of oxygen levels in the exhaust stream. Since the changing levels of oxygen in the exhaust stream is a function of normal driving, the PCM uses the data received from the oxygen sensor via a dedicated signal circuit to make appropriate adjustments (called fuel trims), to the injector pulse widths in order to maintain the air/fuel ratio as close to the ideal 14.7 parts of air to one part of fuel, regardless of the engine speed and/or load. However, large throttle inputs produce large changes in the composition of the exhaust gas, which in turn, require very large fuel trim corrections. Thus, to prevent the time delays caused by large fuel trim corrections, the PCM switches the oxygen sensor to read alternate rich and lean running conditions several times per second. Doing this averages out the differences between extreme lean and rich conditions over very short time periods (typically, milliseconds), and therefore, the PCM only needs to make small, albeit numerous adjustments to the injector pulse widths to maintain an ideal (stoichiometric) air fuel mixture. Typically, the PCM will adjust the injector pulse widths up to seven times per second, based on input data received from the upstream oxygen sensor. Therefore, when a fault, defect, malfunction, or failure occurs in the heating, reference, or signal circuits of an upstream oxygen sensor, the PCM recognizes that it cannot control the air/fuel mixture effectively, and it will set code P2A00 and illuminate a warning light as a result. Where is the P2A00 sensor located? Note that while the image above is a representation of the exhaust layout/configuration on a Toyota application with a V-type engine, the locations of #1 oxygen sensors are always as shown here, i.e., upstream of the catalytic converter, regardless of the application. What are the common causes of code P2A00? What are the symptoms of code P2A00? None found. Ask a question about P2aoo.